[Event] [Santa's Village] <+> [MU Online Fanz] <+> Official 3rd-party [MU Online] Fan Site & Game Guide! Each year, there is a winter celebration, in which Santa visits! During this special event, you can obtain an Invitation to Santa's Village. Use the ticket to go to Santa's Village for free presents and buffs. The Invitation to Santa's Village was supposed to be given free to all players - however, a Cursed Santa has appeared and corrupted Santa's poor Goblins. Now, you must kill Cursed Santa and the Cursed Goblins to obtain the special Invitations! Curse you, Kundun! Typically, the Cursed monsters are found just outside the city's gates. Invitation to Santa's Village can be used 10 times. Speak with the real Santa, in Santa's Village for a free gift. Santa will only give one gift, per character, per 24 hours. You can leave Santa's Village by speaking to NPC Snowman. 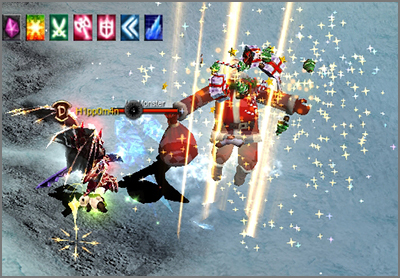 Santa's helper Elves can give you an additional buff.